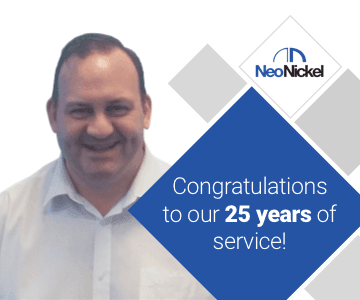 How fast will you respond to my enquiry?NeoNickel aims to provide a quote or contact our customer back within 24 hours after we received an enquiry. NeoNickel aims to provide a quote or contact our customer back within 24 hours after we received an enquiry. How do I request for a quotation? Can I get my shipping document online? No. But any customer can receive shipping documents automatically by email for every order. Please ask our sales team for more information. Shipping documents include invoice, packing list, certificate of conformity and test certificates. Can I get account statement online? No. But you can receive your statement automatically by email every month. Please ask our sales team for more information. I have lost shipping documents, can I request a new set? Yes. Please contact our sales team and they can provide you with a new set by email immediately. You can call or email your sales contact. After the order has been processed, domestic shipping usually takes 1-2 days to deliver and 2-4 days for international shipment. 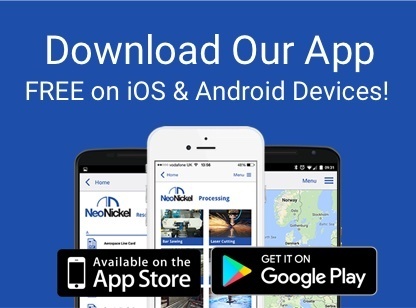 NeoNickel offers express delivery option. Please ask your sales contact for more information. Any customer can receive an open order status report by email as frequently as preferred. This can vary according to the products and specification of your order. Please let us know when you need the goods and we will aim to deliver according to your requirements. Yes, please contact our sales team for more information. Where can I get a copy of NeoNickel ISO certificates? You can download our current approvals from our quality page. Is NeoNickel BS EN ISO 9001:2008 approved? Yes. You can download our current approvals from our quality page. Is NeoNickel AS 9100 C BS EN ISO 9100:2009 approved? Is NeoNickel AS 9120 A BS EN ISO 9120:2012 approved? Has NeoNickel got a Nadcap approval? Superalloy refers to a group of Iron-, Cobalt- or Nickel-based alloys commonly used in extremely high temperature and highly stressed conditions. Such conditions are commonly found in aircraft engines where high-performance nickel-based (most common) superalloys are subject to about 10,000 rpm and temperatures as high as 2000 °C. These conditions are essential because when the engines run at a higher temperature, less fuel is needed. Therefore these superalloys are always going to be in high demand and at the forefront of materials and metallurgical research field. The ‘super’ superalloys are being developed as we speak! Why is nickel added in stainless steel? a.iii. Resistance to stress corrosion cracking particularly in chlorides and caustic environment. The addition of 8-80% of nickel is common to all austenitic heat resistant alloys. Nickel improves the adherence of the Cr2O3 scale and hence enhances oxidation and carburisation resistance. In general, it also reduces sigma phase formation in many alloys. What is gamma and gamma prime? Gamma (ƴ) and gamma prime (ƴ’) is Ni3(Al,Ti) precipitates when nickel-based alloys have been solution annealed and aged under controlled conditions. The addition of aluminium and titanium in the nickel-based alloys results in the formation of gamma (ƴ) and gamma prime (ƴ’) in a two-phase equilibrium microstructure. Some can be seen on microscope some cannot depending on aging time. Gamma prime (ƴ’) is responsible for the enhanced high temperature strength and resistance to creep. 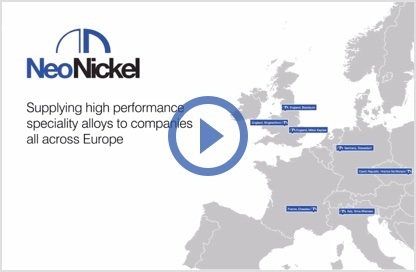 What is nickel based alloy? Nickel based alloys are alloys with nickel content from slightly less than 50% to 99.98% (Metals Handbook; Vol.7 Atlas of microstructures of industrial alloys, 8th edition). They are commonly used in high-temperature and other specialised applications. What is high alloy steel? High alloy steel refers to a group of specialised grades of steel which generally contains alloying elements in excess of 10%. These alloying elements such as nickel, silicon, molybdenum, vanadium, cobalt and chromium add unique advanced properties to base steels. However, they are also more costly and hence making these high alloy steels more expensive than normal steel. The word ‘steel’ here usually covers both ‘alloy steel’ and stainless steel’. Alloy steels are any kind of steel to which one or more alloying elements have been added to produce a desired characteristic or physical property e.g. heat resistant, corrosion resistant etc. Common elements that are added to make alloy steel are molybdenum, manganese, nickel, silicon, boron, chromium, and vanadium. What are the uses of alloy steel? Depending on the grades or added alloying elements, alloy steels can be found in high temperature applications, corrosive environment, high strength components, rotating parts and more. Some of the common components made of 300M/S155 and 4340 Alloy Steel are gears, shafts, aircraft landing gear, high strength bolts and forged hydraulic systems. What are high alloys’ main alloying elements? What are the main alloying elements and their properties? Aluminium (Al) – Strengthening in small amounts, oxidation in the range of 1-5%. It is a ferritiser and so promotes sigma formation. Boron (B) – Strengthening element from 0.0005-0.005%. It also improves hot workability but decreases weldability. Cerium (Ce) – Improves oxidation resistance, as do the other rare earth elements such as La and Y etc. Chromium (Cr) – Improves corrosion property as it forms protective chromium oxide scale in oxidising media, high-temperature oxidation and sulphidation. Cr also adds strength and carburisation resistance, and promotes sigma formation. Cobalt (Co) – Solid solution strengthener and austenitiser. Copper (Cu) – Improves resistance to salts and reducing acids (i.e. non-aerated sulphuric and hydrophuric acids). If added to Ni-Cr-Mo-Fe alloys, Cu enhances resistance to hydrochloric, phosphoric and sulphuric acids. Iron (Fe) – Present from 0-75% in heat resistant alloys for improved high-temperature mechanical strength and carburisation. It is a ferritising element. 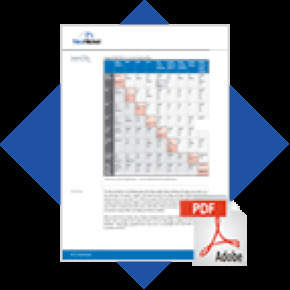 Fe helps reduce cost of alloying elements and controls thermal expansion. Molybdenum (Mo) – Solid solution strengthener. However, excessive addition can lead to catastrophic oxidation promoting intermetallic phase formation. It also improves pitting resistance in stainless grades. Nickel (Ni) – Improves metallurgical stability, thermal stability and weldability. There are about 8-80% Ni present in all austenitic heat resistant alloys. It helps reduce sigma formation. Ni also improves resistance to reducing acids and caustics, improving its performance against stress corrosion cracking particularly in chlorides and caustics. Excessive amount of Ni can make an alloy susceptible to sulphidation. Niobium (Nb) – Strengthener, both as carbide and solid solution. It can be quite detrimental to oxidation resistance at temperature above 1000°C. Nitrogen (N) – Strengthening element added up to about 0.25%, more commonly around 0.15% to high-performance alloys. N is an austenitising element which retards sigma formation. Silicon (Si) – Improves oxidation and carburisation resistance. Si is a ferritiser which promotes sigma formation. Titanium (Ti) – Strengthening element as a carbide former. Hi content of Ti leads to gamma prime formation which are ferritiser and so promoting sigma formation. Tungsten (W) – Solid solution strengthener. What are high strength alloys? High strength alloys usually refer high-strength low-alloy (HSLA) steels or microalloyed steels. These alloys are engineered to have better mechanical and corrosion resistant than carbon steels for specific conditions. These are not to be confused by the precipitation hardened or aged hardened grades which are classed as high-strength stainless steel or nickel-based alloys. More information on HSLA can be found on the ASM international website. CRA is an abbreviation for corrosion resistant alloys. CRA metal refers to a vast variety of alloy families which are designed to have considerably better corrosion resistance than carbon steels. These alloys tend to have common alloying elements such as chromium, copper, nickel and molybdenum. Nickel (Ni)- Ni also improves resistance to reducing acids and caustics, improving its performance against stress corrosion cracking particularly in chlorides and caustics. Excessive amount of Ni can make an alloy susceptible to sulphidation. Molybdenum (Mo) – Improves pitting resistance in stainless grades. Corrosion is an electro-chemical process that occurs between the surface of the material and the environment it is in contact with. For steel, it is essentially a process of oxidation and generally results in rusting on the surface. Corrosion can have various effects on the aesthetic and integrity of the structure depending on the extent of the process. Common types of corrosion found in the metal industry are uniform corrosion, pitting corrosion, galvanic corrosion, crevice corrosion, intergranular corrosion, dealloying and environmentally induced cracking such as hydrogen-induced cracking (HIC), stress-corrosion cracking (SCC) and corrosion fatigue. More information about specific case study on corrosion can be found in our technical resources. What does corrosion resistance mean? Corrosion resistance, in material science, means a material’s ability to retain its integrity including chemical, physical and mechanical properties when subjected to a corrosive environment. What are the main types of corrosion? Uniform corrosion: This is the most common form of corrosion and leads to general loss of material over the surface of the structure. As a result, the corroded structure could eventually lose its overall strength and failure tends to occur at the weakest cross section. Pitting corrosion: Unlike uniform corrosion, pitting corrosion is a localised attack occurring on random spots where the protective oxide layer breaks down. Each pit can be shallow, deep or undercut. This type of corrosion is especially common where halide ions are present in the media such as pipes used in seawater applicationS. The depth, size and growth rate of the pits are impossible to predict and thus failures due to pitting corrosion can occur unexpectedly or much faster than those caused by uniform corrosion. Galvanic corrosion: This corrosion process is caused by contact between dissimilar metals. The corrosion rate depends on the position of the metals on the galvanic series and various other factors. Crevice corrosion: When two pieces of similar or dissimilar metals are positioned next to each other by means such as fastening, pressing, screwing or stacking, there exists a small gap between them. This confined region or gap is subjected to a higher concentration of corrosive environment due to higher electro-chemical activity and hence, higher risks of uniform and pitting corrosion. Intergranular corrosion: This type of corrosion occurs along the grain boundary of the material due to the loss of chemical stability in the alloy metallurgy. Dealloying: This type of corrosion is caused by the attack of certain alloying elements in the metal causing them to dissolve. This leads to metallurgical instability and loss of integrity of the structure. Environmentally induced cracking: This type of corrosion is caused by specific environment and leads to micro cracks which could grow into larger cracks causing catastrophic failure in the structure. Hydrogen-induced cracking (HIC), stress-corrosion cracking (SCC) and corrosion fatigue are common examples of environmentally induced cracking. What is Grade 2 titanium? Titanium Grade 2 is commercially pure titanium, also known as titanium CP3. It has excellent corrosion resistance in oxidising media and moderate strength combined with good welding and cold-forming properties. Titanium Grade 2 has an alpha crystalline structure. Its density is approximately 50% that of nickel alloys and stainless steels. Titanium Grade 2 is widely used in marine, oil & gas and chemical processing applications. Titanium Grade 5 or Titanium 6Al-4V is an alpha-beta titanium alloys and by far the most widely used grade of titanium. This alloy was originally developed for light-weight and high strength applications in the aerospace market. More recently the alloy has seen extensive use in the oil & gas market where a combination of high strength, corrosion resistance and lighter weight is essential. The alloy can be heat treated to different levels of strength. The density of Ti Grade 5 or Ti 6Al-4V is about 50% that of nickel-based alloys and stainless steels. It is therefore used extensively in various applications at service temperatures up to 400°C due to its high strength-to-weight ratio. What does CP grade titanium mean? CP grade titanium refers to commercially pure grade of titanium which contain 99% or more titanium in its composition. Common CP grade titanium are Titanium Grade 1 (Titanium CP4), Titanium Grade 2 (Titanium CP3), Titanium Grade 3 (Titanium CP2) and Titanium Grade 4 (Titanium CP1). Titanium is weakly magnetic or you can say it is paramagnetic to be precise. It has a relative magnetic permeability greater than 1. Paramagnetic is attracted to applied external magnetic field but do not retain the magnatisation when the applied magnetic field is absent. Yes, nickel alloys are magnetic. Magnetic alloys are those that contain at least one of the following elements – iron (Fe), nickel (Ni) and cobalt (Co). What is the best heat resistance metal? 602 CA® is our strongest and most oxidation resistant alloy readily available for service above 1040°C. 602 CA® has been oxidation tested to 1230°C. General service experience shows the alloy working well above 1150°C. However, one cannot successfully choose an ally based on temperature limitation alone. Other factors such as atmosphere/media/environment, mechanical requirements and usage should also be considered when choosing the right alloy for an application. Which alloys are good for heat resistance? Alloy 321, 316Ti, 309, 310S, 800 H/AT, 253 MA®, RA330®, RA333®, 600, 601, 602 CA® are generally referred to as heat resisting alloys and used in various high temperature applications. What is Inconel alloy material? Inconel® alloy are basically nickel-chromium alloys with added aluminium for high levels of oxidation resistance and corrosion resistance when exposed to high temperatures. These alloys are perfect for use in the heat treating industry, oil & gas applications and hot sections in the aircraft or motorsport exhaust systems. The most popular nickel-chromium alloys are Alloy 600, 625 and 718. INCONEL® is a registered trademark of Special Metals Corporation for these nickel-chromium grades. What is Nimonic alloy material? Nimonic® alloys are basically nickel-chromium alloys. NIMONIC® is a registered trademark of Special Metals Corporation. The high level of nickel and chromium provides excellent corrosion and oxidation resistance when exposed to high temperatures. They also display high stress rupture strength and good creep-resistance making them suitable for use across numerous industries including aerospace, motorsport and power generation. What is carburising / carburisation? Carburising or carburisation refers to a process in which metals i.e. steel, stainless steel etc. are heated in a carbon-bearing atmosphere. Carburisation can be advantageous or disadvantageous depending on the intent of the operation. Under controlled heat treatment process, it is used to harden the surface of a material. On the other hand, it can cause premature failure and cracks when components made of materials susceptible to carburisation are used in the high temperature carbon-containing process. Which alloys are good for resisting carburisation? Alloy 600, 602 CA®, RA330® and RA333® have excellent resistance to carburisation due to high nickel content in the alloys. What is a Hastelloy alloy? Hastelloy® refers to a range of corrosion and heat resistant nickel alloys. It is a registered trademark of Haynes International. Hastelloy® alloys are widely used across chemical processing, oil and gas, pharmaceutical and environmental industries. Displaying excellent resistance to stress corrosion cracking and non-oxidizing acids, these alloys have been used for numerous applications including stack liners, reaction vessels, heat exchangers, aircraft cabin heaters, transition ducts etc. 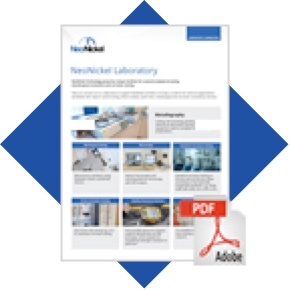 NeoNickel offer some of these Hastelloy® grades or the equivalent. Please contact us for more information or find out more about Hastelloy® on our website. What is an Incoloy alloy? Incoloy® refers to a nickel-iron-chromium alloys range designed to have a high temperature strength combined with exceptionally high corrosion resistance to aggressive environments. Some of the popular and readily available options from the Incoloy® range are alloy 800H and 800HT® and Alloy 825. The word Incoloy® is a registered trademark of Special Metals Corporation. What does UNS stand for? UNS stands for Unified Numbering System for the metals and alloys industry. It is a jointly published standard of the Society of Automotive Engineers, Inc. (SAE) and the American Society for Testing and Materials (ASTM). The UNS designation helps to standardise and unify various internationally used metals and alloys tradenames for efficient indexing and cross-referencing. What does a Werkstoff number mean? Werkstoff number is the numerical code preceding the letters DIN (Deutsches Institut Fur Normung). It is commonly used as a stand-alone numeric code to identify specific grades of materials. The word werkstoff itself means material or the matter which things are made from. Other specifications and references on all NeoNickel alloys can be found on our website. ASTM stands for American Society for Testing and Materials. It is one of the largest non-profit standards developing organisation in the world. The standards are used by many from designers, manufacturers, and engineers to legislative officers to improve the consumers’ quality of life. In metal industry, ASTM standards are referred to when, for instance, quality, testing of materials and manufacturing control are concerned. ASME stands for American Society of Mechanical Engineer. It is a professional association. In metal industry, ASME codes and standards are prevalently used as a reference to material properties, manufacturing methods and quality control for pressure vessels and other critical components such as bolts, fasteners, valves, pipework, pipe fittings etc. Yield strength, also known as yield stress, is a material property. It is a stress level where a material starts to deform plastically. It should not be confused with ‘yield point’ which refers to a stress level when non-linear deformation starts. Tensile strength is the amount of tension or tensile force required to stretch the material until it starts necking and eventually breaks apart. It is also referred to as the Ultimate Tensile Strength (UTS). Tensile strength or the UTS are one of the most common physical properties measured and used across the metal industry. 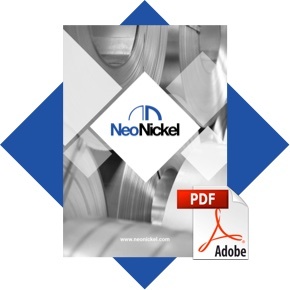 To find out more about specific tensile strength or the UTS of NeoNickel alloys, please see our downloadable data sheet on our alloy pages! What is the difference between sheet and plate? The difference between sheet and plate and their threshold thickness vary from supplier to supplier. At NeoNickel, we generally consider flat products with less than 4mm thickness to be sheet materials while those with higher thickness to be plate materials. It must be emphasised that this is not true for all suppliers and so it is always safer to check and specify the exact size when referring to flat products. The difference between pipe and tube generally lies on the way they are measured and described. Tube sizes are described by their OD (outer diameter). The average wall thickness or minimum wall thickness of the tubes must be specified when enquired. Pipe sizes, on the other hand, are described by their nominal pipe size (NPS) in the USA or nominal bore (NB) in the EU together with their schedule (wall thickness reference). How do you measure hardness of an alloy? Although there are many acceptable ways to measure hardness of a material, the most commonly used method in metallurgy is to measure the size of an indentation made by a hardness testing machine. The measurement varies with the weight and scale used during the testing which, in turn, depend on the type of the material being tested. The most commonly used scales are Rockwell A/B/C, Brinell, Vickers and Knoop. What is a duplex alloy? Duplex alloys are those with dual-phase microstructure. Duplex stainless steels, for example, contain about 40-50% ferritic and 50-60% austenitic microstructure giving them a good combination of corrosion resistance as well as strength. At NeoNickel, we offer various grades of duplex and super duplex stainless products to suit your exact requirement. What is the difference between cast alloys and wrought alloys? Cast alloys are generally those that are formed directly from liquid metal into a near-net-shape products or billet via solidification. There are many methods of casting such as high-pressure die casting, injection casting, industrial casting, low-pressure die casting etc. Each method is selected based on the final applications of the casting products. Wrought alloys, on the other hand, start off as cast ingots or billets and subsequently more hot and/or cold mechanical work is put on them. The mechanical work generally used includes hot/cold rolling, extrusion, forming and forging. These processes produce a variety of final product forms such as round bar, square bar, sheet/plate, coil, tubes etc. All NeoNickel products are wrought alloys. Why is grain size important for an alloy? Grain size and grain geometry can have a significant impact on physical and mechanical properties of an alloy such as its yield strength, ultimate tensile strength (UTS), formability, hardness, creep strength etc. Some alloy grades require the grain size to be more refined while some undergo heat treatment process to make the grains coarser to suit their final applications. The grain size requirements are specified in the ASTM standard for certain grades i.e. 625 (DDQ) to ensure adequate manufacturing controls are in place. It is thus important to bear in mind any possible effect of various grain sizes on your production and final application when purchasing a material. What is the difference between G28A and G28B Corrosion test? ASTM G28A is a ferric sulphate and sulphuric acid boiling test (50% H2SO4 + 42g/litre Fe2 (SO4)3) while ASTM G28B, also known as the Green Death test, is a mixed acid or oxidising salt boiling test (sulphuric acid, hydrochloric acid, ferric chloride and cupric chloride – 23% H2SO4 + 1% HCl + 1% FeCl3 = 1% CuCl2). ASTM G28A and G28B tests were developed as qualitative corrosion tests to verify that the metallurgy, melting process and thermo-mechanical processing for certain corrosion resistant nickel alloys had been completed correctly. The tests are commonly used to qualify Hastelloy® C22, C276, C2000®, Alloy 59 and Alloy 686. This ensures that the material is in the fully solution-annealed condition and is not subject to intergranular corrosion resulting from the presence of intermetallic / carbide precipitates at the grain boundaries (sensitisation). There is no pass or fail criteria for the tests. The results are agreed between buyers and suppliers. Stainless steel is the generic name of different grades of steels (containing low carbon and iron), used primarily because of their corrosion resistance. All stainless steels share a minimum percentage of 10.5% chromium element. Chromium (Cr), usually a deciding factor, nickel and molybdenum are commonly added to steels to improve their corrosion resistant and make them ‘stainless’. Most of the stainless steel grades will have a UNS number that start off with letter ‘S’ such as UNS S32100 (Alloy 321) and UNS S31008/S31009 (Alloy 310/310S). What is a cobalt alloy? An alloy is classed as a cobalt alloy when its chemical analysis shows cobalt as a main or balancing element. They belong to the reactive and refractory group of metals and alloys according to the Unified Numbering System (UNS) reference. Cobalt is useful in applications that can utilize its magnetic properties, corrosion resistance, wear resistance and its strength at elevated temperatures. They can be commonly found in aerospace hot-end components, industrial gas turbines and specialised valve components (i.e. for viscous and large sediments). Precipitation hardening is one of the heat treatment processes involving heating up particular grades of alloys in order to form tiny particles (hard precipitates or pinning effect) which in turn results in higher strength of the material. How is forging ratio calculated? Forging ratio, also known as forging reduction, is calculated by dividing the original cross-section by the final cross-section of the forged materials. This could be expressed as a number i.e. 16 or a ratio i.e. 16:1. The forging ratio shows the amount of cross-sectional reduction taking place after forging or rolling process which in turns implies the amount of work done on the materials. Reduction of area (ROA or RA) is usually used to describe the ductility of a material by taking the difference between the initial and the final cross-sectional area at fracture of a specimen. Reduction of area can be obtained from a standard tensile testing. a. Elongation (El) is usually used to describe the ductility of a material in terms of percentage elongation (%El). %El = [(Lf – L0)/L0] x 100 where Lf – Final gage length at fracture and L0 – Initial gage length of the specimen. AMS materials tend to be used in the production of parts and components in the aviation and motorsport industry where the integrity of the materials is critical. AMS stands for Aerospace Material Specification in the metal industry. Aerospace Material Specification cover a wide range of alloy grades ranging from stainless steel to titanium and nickel alloys. PREn stands for Pitting Resistance Equivalent Number. In general: greater % Mo = the higher PREn value = greater corrosion resistance. When tungsten is taken into account, PRENW can be calculated and used to compare the corrosion resistant between different alloys. PRENW = Cr% + 3.3Mo% + 1.65W% + 16N%. What does a 3.1 Certificate contain? 3.1 Certificate usually contains results from standard material testing. This could include chemical analysis, mechanical testing, corrosion testing etc. At NeoNickel, most of our materials in stock are 3.1 certified by our leading suppliers. What is a 3.2 certificate? TUV / Lloyds or clients specified Inspection authority must be notified to complete the upgrade. Inspector must identify the test sample & stamp the material being upgraded. Required test pieces are stamped before they are cut from the sheet, plate, bar or pipe. In addition the Inspector stamps the parent material. Parent material must retain the inspectors stamp after the test piece has been cut & sent to the test laboratory. Inspector has to witness the testing completed at the nominated test laboratory. Inspector stamps the mill test certificate & test lab certificate. Inspection authority who completed the witness of the testing issues an EN102043.2 test certificate. 625LCF (UNS N06626) is a variation of alloy 625 specifically developed for a low-cycle fatigue (LCF) application. An advancement in the development of alloy 625LCF products include vacuum induction melted, controlled chemical composition and a guaranteed fine grain size. These result in greatly improved fatigue resistance and thermal stability. Moreover, alloy 625LCF also exhibits excellent formability and weldability. It is commonly used for fabrication of bellows and fabricated structures exposed to cyclic conditions at elevated temperatures. What is Pratt & Whitney LCS approval? Pratt & Whitney LCS approval refers to an approval for a raw material to be Laboratory Controlled at Source (LCS). Having been approved by Pratt & Whitney LCS, the materials can be supplied to make parts or components for Pratt & Whitney end use. Corrosion fatigue occurs as a result of the reduction in fatigue resistance of the metal in a corrosive media. This is normally encountered by premature failure of the metal under cycling conditions. General corrosion is a uniform corrosion, which is the most commonly encoutered corrosion mechanism. It is caused by a chemical or electrochemical reaction which happens uniformaly over the entire exposed surface area . The metal progressively gets thinner and eventually fails. Localised corrosion occurs in a specific location or under specific conditions. Localised corrosion is the key mode of failure of process equipment across all industries where conditions are severe and corrosion resistance is critical. This type of corrosion is commonly know as Pitting, Crevice and MIC (Microbially Influenced Corrosion). Pitting is a very localised corrosion attack resulting in the formation of holes in metal. Holes (pits) are generally small but they propagate rapidly leading to perforation of the metal and failure of the process equipment in a very short period of time. Who should I talk to regarding my order? Our sales contact or please contact our nearest office to you. What is your contact number in Czech Republic? What is your contact number in France? What is your contact number in Germany? What is your contact number in Italy? What is your contact number in Spain? What is your contact number in the UK?